The Wizard of Oz opens this week! 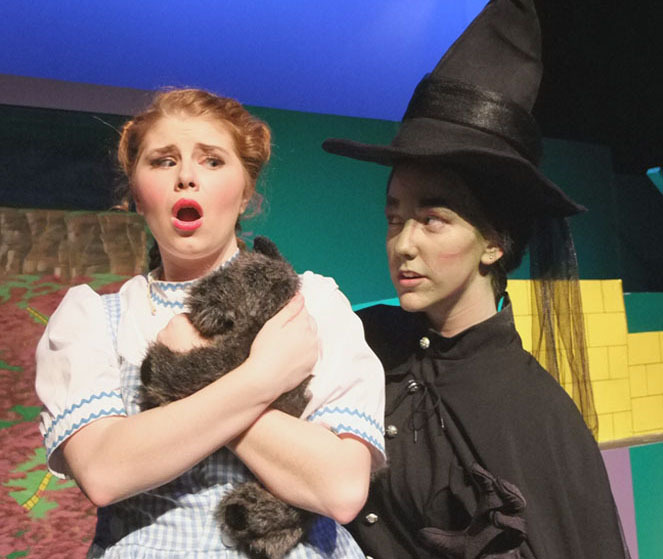 Grab those ruby slippers and get your tickets now to see The Wizard of Oz on stage in the Wellmont Regional Center for the Performing Arts at Northeast State Community College April 7-10! Directed by Elizabeth M. Sloan, the musical version of Oz brings Dorothy Gale, the Wicked Witch, Toto, and the Wizard himself to life. Stepping into the iconic role of Dorothy is Shelby Cade, who fully understands how big those ruby slippers are to wear. 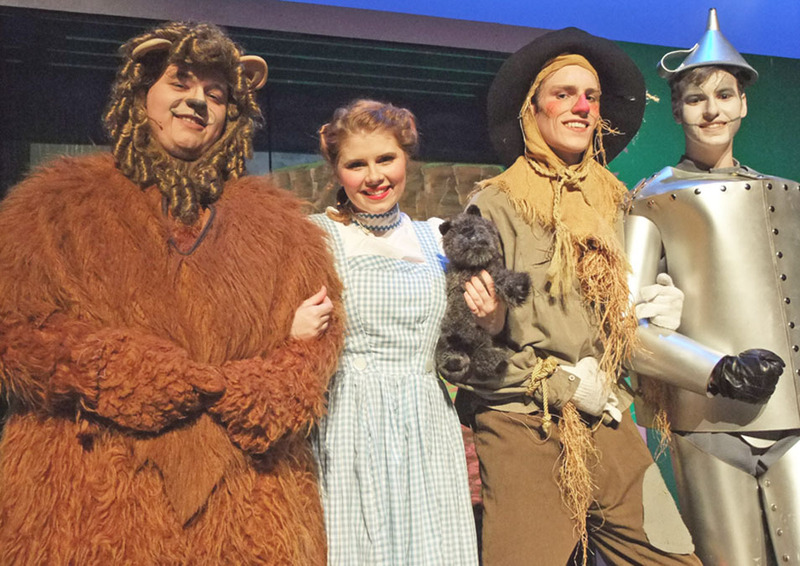 The Lion (Charlie Schill), Dorothy (Shelby Cade), Scarecrow (Tyler Alley), and Tin Man (Joshua O'Bryan) make their way to the Emerald City. A seasoned performer, she has played leading roles in The Importance of Being Earnest, Noises Off, Doubt, A Parable, and Crimes of the Heart. Shelby also performed at the Kennedy Center in Washington, D.C. as part of the Irene Ryan Acting Competition. The story follows much of the movie and Baum’s traditional story about Kansas, the tornado, and Dorothy’s fateful trip over the rainbow where she meets a slew of colorful characters and snags a snazzy pair of ruby slippers. When not fighting off the Wicked Witch of the East (Dani Trinkle), Dorothy befriends the Scarecrow, Tin Man, and Lion all of whom join her quest to the Emerald City hoping their own wishes might be granted by the Wizard of Oz (Derek Smithpeters). Dorothy and the Wizard (Derek Smithpeters) discuss flight routes back to the Midwest. In addition to Sloan’s direction, Oz includes singing and dancing into the production. Northeast State music instructor Tawana Teague heads up the musical numbers while fellow Humanities faculty member Louise Dickson brings her wealth of dance experience as the play’s choreographer. Joining Cade to form the yellow-brick-road-traveling quartet are actors Tyler Alley (Hunk and Scarecrow), Charlie Schill (Zeke and the Lion) and Joshua O’Bryan (Hickory and the Tin Man). Alley is a Theatre major at Northeast State who performed in College’s production of Dracula last fall. Needless to say winning the Scarecrow role marks the highlight of his career thus far. O’Bryan is also earning a degree in Theatre from Northeast State. His theatrical roles include productions of Chess, Godspell, and The Sound of Music. He drew inspiration from Baum’s book about Hickory’s unrequited love for a woman in Kansas as a metaphor of the Tin Man’s longing for a heart. Schill, a one-time engineering student and now theatre major at East Tennessee State University, has performed in A Midsummer Night’s Dream, Come Rain or Come Shine, and Lysistrata. He tackled the demanding dual roles in Oz while picking up a few singing tips and dancing steps well. Dorothy gets an earful from the Wicked Witch (Dani Trinkle). The Wizard of Oz ranks as one of the largest and most elaborate productions ever staged at Northeast State. Sloan directs both flying monkeys and a crew of Munchkins, many of whom are first-time kid actors making their stage debut. The production’s award-winning technical director, and Northeast State alumnus, Brad McKenzie – and Cade’s fiancée – oversees the production’s visual aesthetic. “The elements of this production have pushed all of us to bring our collaborative creativity to the table. We have all learned so much,” said Sloan, who took the reins of Northeast State Theatre in 2009. Actors often note Sloan’s credentials as a performer and teacher as a driving force in attending Northeast State’s theatre program. She performed in more than 30 productions as a member of the Barter Theatre’s Equity Acting Company. She is a current member of the Actor’s Equity Association and East Tennessee Repertory Theatre. Cast and crew members for Oz number more than 70 people. Perhaps Schill best summed up the merry old Land of Oz experience best when describing the production and how his colleagues felt about theatre. 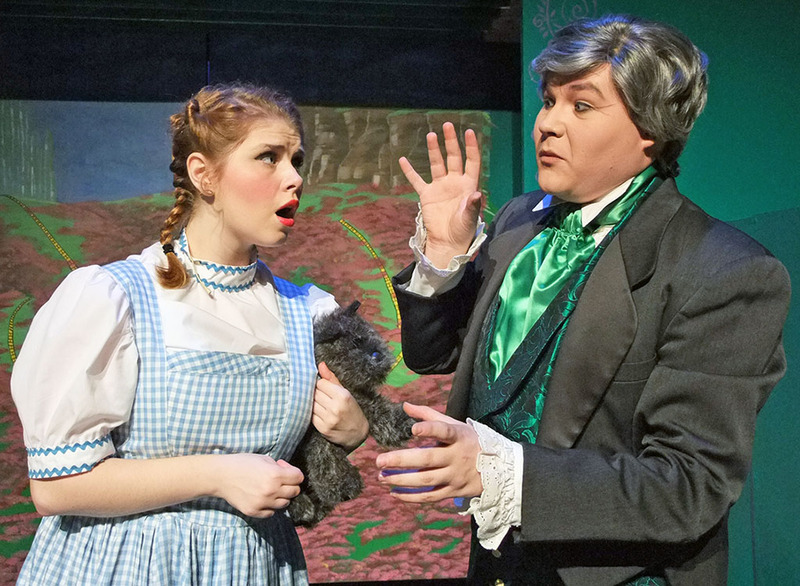 Northeast State Theatre’s production of The Wizard of Oz runs April 7-9 at 7:30 p.m. and April 9-10 at 2:00 p.m. in the Wellmont Regional Center for the Performing Arts. Tickets are $10 general admission, $8 for students and seniors, $6 for children under 12. Northeast State students with valid student identification get one free ticket. Tickets can be purchased online now at www.northeaststate.edu. For more information, contact Northeast State Theatre via e-mail at emsloan@NortheastState.edu.